Summary: A new version of Baldur's Gate updated for the mobile age and available on the iPad. Although it was good fun, it failed to capture my attention for long due to some issues with the playability on the ipad, and it lacked the magic of the original version. A screenshot that will become familiar - most of the wilderness areas look very similar. to the hours spent on character generation trying to role up the best possible characters, to the joys of Boo, the space hamster. It was one of the very first PC roleplaying games I played, and one of the only games I have ever completed, and more than once at that. 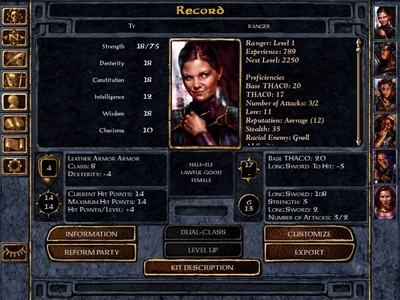 I came back to Baldur's Gate a couple of times over the intervening decade, and I was pleased to hear it was coming to the iPad. 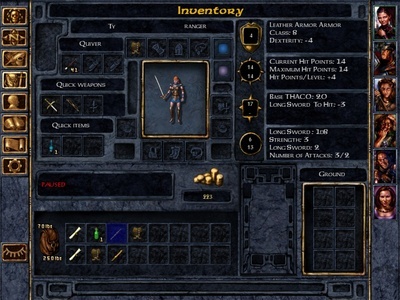 The inventory screen - although there are lots of slots they will quickly fill up. This can get a little annoying as you try to stock up on arrows, pellets, and healing potions, whilst still retaining space for loot. The game is little changed, and I was interested to see how the interface would stand up to a touch screen port. 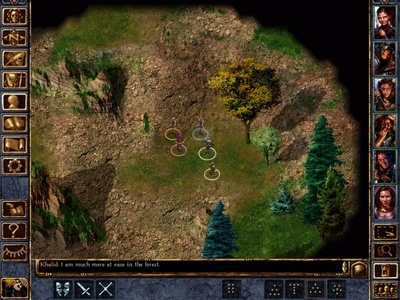 It was quite good, the top-down isometric view works well on the touch screen, and the mechanics (Advanced Dungeons and Dragons 2nd ed) are platform agnostic, as is the high fantasy setting. 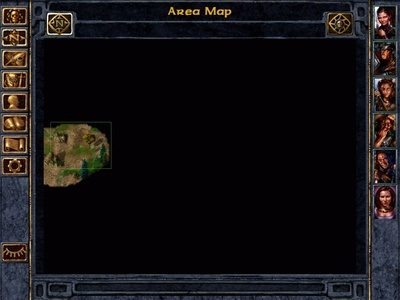 Exploration time - let's clear that Fog of War! However, I didn't find it as easy to navigate with touch screen as with mouse and keyboard: one annoying issue stood out - it's difficult to get your party through certain doors. It's also hard to select the right dialogue options - extremely irritating if you didn't save before a critical piece of plot-relevant dialogue. I'm not sure if this is a bug in the game, or if I was just inept, but this made the experience much more frustrating than it should have been. Character sheet - I spent altogether too long trying to get the absolute best characteristics I could. If you're aware of Advanced Dungeons and Dragons, or any other high fantasy setting, then you'll be on familiar territory. Most of the major fantasy races are represented: humans, elves, half-elves, dwarves, gnomes, and more besides. Once you've chosen your race, then you can pick a class, and again we're on familiar territory: Thief, Wizard, Cleric, Druid, Ranger, and so on. These choices don't have a huge impact on the game, as you have a party of 6 chosen from a number of characters you meet throughout the game, you'll be able to cover most options no matter what starting character you pick. The story is also familiar, at least in its tropes. An orphan, with mysterious origins, is beset by unexpected assassins. Bereft of their long-time adopted parent, they must make their own way in the perilous world, gradually uncovering the secrets of their past (which, of course, are grand in scale). Once you set off alone the difficulty scales quite well. 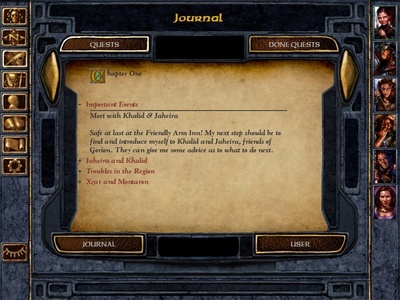 The first section in Candlekeep has all of the expected fetch and slay quests that you need to familiarise yourself with the mechanics of the game. The backgrounds are beautiful, and the soundtracks is great, but I couldn't quite get the level of zoom right on the ipad size. It was either too far away and I found it hard to select things on screen, or too close and I lost the abiloty to direct my party flexibly and easily. 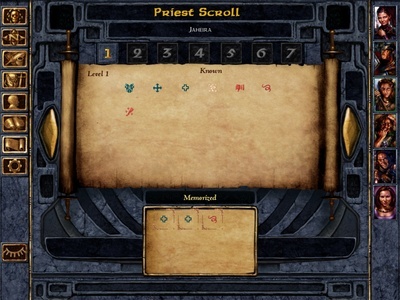 Priest spells - Although there's a huge variety of these I tend only to memorise the healing spells, and the occasional Entangle. 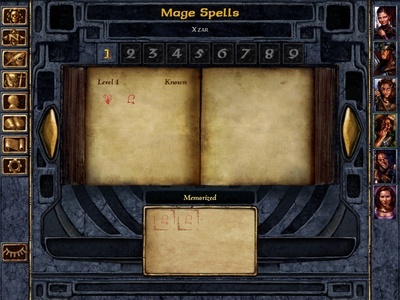 Wizard spells - I found these much harder to manipulate and target on the ipad version. Another source of frustration. For me, this was a pleasant and nostalgic trip back to a game I have very fond memories of, but it was much better the first time round than the second. Perhaps simply because back then, I had never played anything like it before. Nostalgia dragged me a certain way through, and made me forgive some of its user interface issues. I suspect if this was your first visit to the game, then you might be less forgiving. I think the developer should have spent a little more time checking how playable the games was on the ipad, as the door/dialogue issues should have been easy to fix, and would have made a big difference to the playing experience. Did you play the original version? How do you feel about the Enhanced Edition? 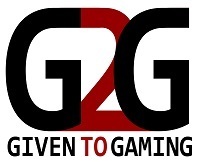 Let me know by leaving your opinion in the comments box.